ex-Handy Prem: Where/what are they now? Wanted to make a companion thread to the ex-Nix one over on the Nix side of the forums. Would be nice to check up on some of the non-Kiwi players who have gone on to bigger and better things since they've left the NZ Premiership. Eugenio Pizzuto - Former Weenix player, currently signed to Pachuca in Liga MX playing for their U17 side. A regular in the Mexico U17 national team, missed the latest squad due to injury but scored in an October friendly tournament against Argentina and USA. I get the feeling Sundowns buys players so other teams can't have them. is Pizutto eligible for NZ as well? 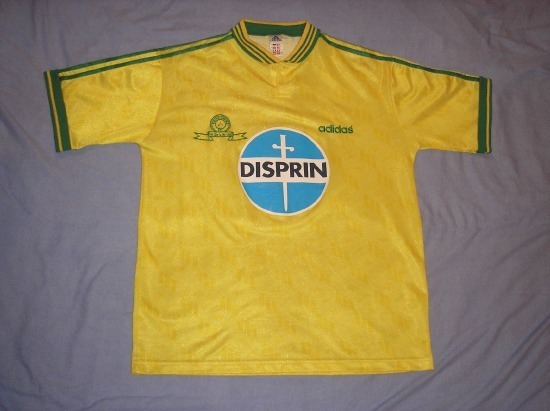 Sundowns is actually the most 'random' football shirt I have, got this version from about 2001. Enjoying their recent New Zealand connections. Oska, mrsmiis, and coochiee endorse this! Tade scores again (pen) for AmaZulu as they draw 1-1 with Highlands Park in a cup game. Highlands Park win 3-1 on penalties, which Tade was not involved in as he was subbed off earlier. Any other ex Premmy players floating around? Surely if we put our heads together we can think of a few? Any news of where Roy Kayara has ended up? Shame TW couldn't hold on to him. Tade now at Sundowns in PSL, and scores in his first game.